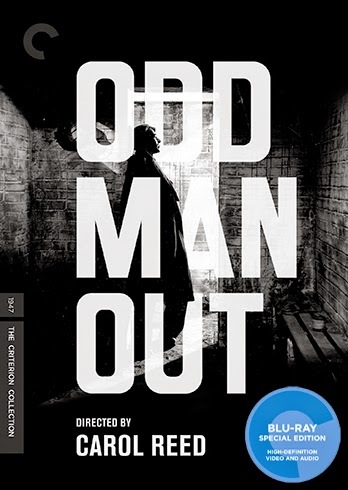 In an interview included on this Criterion release, film scholar John Hill states that Carol Reed's 1947 film “Odd Man Out” is substantially more sympathetic to its characters than the F.L. Green book of the same title from which it was adapted. I can scarcely imagine how withering the novel must be because Reed's film is not exactly a humanitarian showcase. It's difficult to evaluate which set of characters comes off seeming more self-absorbed: the members of “The Organization” (clearly meant to be the IRA) or the citizens of Belfast (a city which goes unnamed in the movie) who don't want to get involved in any kind of troubles. Or Troubles. We don't have to wait long for the payoff. The heist goes off smoothly enough, but the exertion makes Johnny dizzy, causing a delay in the getaway that leads to an exchange of gunfire that leaves our hero wounded and a guard dead. Johnny winds up stranded on the streets of that unnamed city that strongly resembles Belfast (mostly recreated on London sets though with enough location shooting to add a dose of verisimilitude), his life bleeding away drop-by-drop as he seeks assistance from the locals he and his Organization are, in theory or at least in their blinkered world view, fighting for. He will have to look long and hard for that help. As Johnny barely clings to consciousness, one citizen after another passes on the opportunity to intercede on his behalf: a couple seeking to steal a kiss skulks away when they stumble on Johnny's hideout, a cab driver dumps Johnny's limp body in the mud-soaked street and a bartender bribes a man just to take Johnny out of his establishment. One of the few men who takes a keen interest in Johnny's plight is Shell (F.J. McCormick) who rushes off to Father Tom (W.G. Fay) in order to sell information about Johnny's whereabouts; he's crushed to learn that the priest has nothing more tangible to swap than mere salvation. It's a grim array of salt-of-the-Earthers looking either to pass the buck or to make a buck off Johnny, though their lack of charity is strongly correlated to (and perhaps justified by) their contempt for the Organization. That excuse doesn't hold for faithful Kathleen, who loves Johnny so completely she shuts out all other worldly concerns. When she first reads the headline about the guard killed in the botched robbery, her only thought is “Poor Johnny.” Screw the guard. She shows little more empathy after she takes to the streets to track down her man; in a conversation with Father Tom, she declares quite plainly that she would rather kill Johnny than turn him over to the police, and she just might mean what she says. I suspect she's intended to be a true-heart heroine, but her monomania renders her the most problematic character in a film packed to the gills with them. 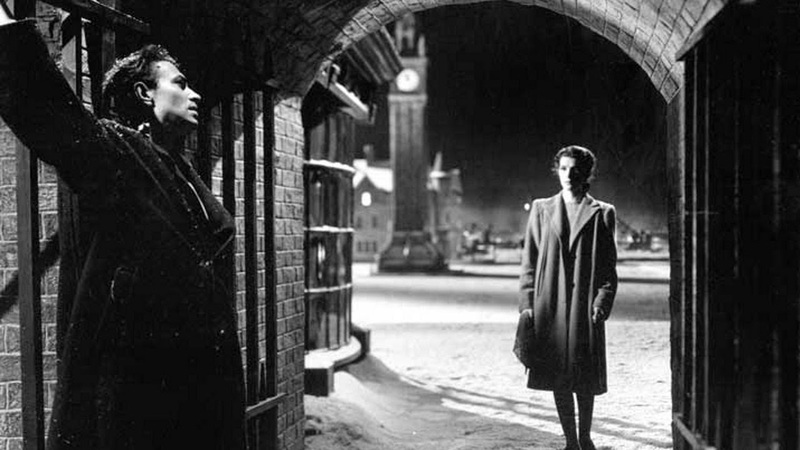 “Odd Man Out” was a pivotal film for director Carol Reed. It was the first of three post-war works (“The Fallen Idol” and “The Third Man Out” following in 1948 and 1949, respectively) that helped make him an international force, and he enjoyed considerable creative control from the producers. Reed was free to indulge his fondness both for expressionism and poetic realism, leading to fascinating if not always fully satisfying results. The film begins in a naturalistic register and moves step-by-step into more surrealistic territory as Johnny's grip on this world slowly weakens. The nighttime streets are moodily lit in rich black-and-white, sometimes bustling and sometimes deserted, the perfect shadowy labyrinth for our protagonist to lose himself in. Highly stylized effects depicting Johnny's delusions (he sees faces in his beer bubbles; ghostly figures gesture to him) are inventive but also a bit ponderous; the hallucinatory flights of fancy that Powell and Pressburger staged with such flair during the same era don't work as well here, at least not to my taste. 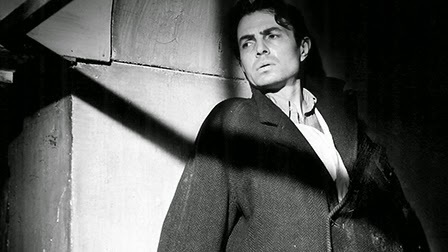 Mason was in the earliest years of his stardom, then best known as the romantic villain in the popular Gainsborough melodramas, and fresh off a box office smash with “The Seventh Veil” (1945). Here he takes on a decidedly non-glamorous role as a pseudo-hero who spends most of the film slumped in a chair or leaning against a wall, a passive figure who serves mostly as a prop for the various people whose paths he crosses. He bleeds, he gasps, he gawks helplessly as his fate is put in the hands of a series of mostly uncaring souls, including a hard-drinker artist (an enjoyably histrionic Robert Newton) who wants to paint Johnny's portrait right at the moment of his death! Reed and his team (including the great cinematographer Robert Krasker) pull off the neat trick of letting us see the world through Johnny's eyes while also holding him at a distance like a sideshow attraction on display. Mason gets as much mileage as possible from a series of severely restricted situations, keeping the audience fully in his orbit even as he lapses into a near comatose state. John Hill and others who speak on this Criterion release claim that the casting of Mason naturally makes Johnny a more sympathetic figure. Mason was irresistibly charismatic, but was he ever an immediate point of empathy for viewers? Mason sneered with the best of them, and was the master of seeming irritated by everyone and everything around him, perhaps the most chronically colicky superstar of his day. Johnny McQueen eats a big dose of humble pie as he is forced to accept his inexorable obsolescence, but he's also still a thug willing to steal and kill to promote his agenda and then to hide and escape instead of face justice. If he doesn't look quite so bad compared to some of the other characters adrift in the gloomy Belfast night, that's not exactly a ringing endorsement. The film is presented in its original 1.37:1 aspect ratio. The black-and-white contrast is very strong with thick blocky shadows that set the proper mood. Image detail is strong but not razor-sharp throughout with a few scenes looking slightly boosted from a likely digital cleanup. No complaints, however. The linear PCM Mono track is crisp and evocative even with a relatively flat feel. The score by William Alwyn benefit from the lossless treatment, never sounding reedy or distant but not being too overwhelming either. Optional English subtitles support the English dialogue. Criterion has assembled an impressive array of extras for this Blu-ray release. “Template for the Troubles” (24 min.) is an interview with film scholar John Hill. The interview is conducted in the Crown Club, a Belfast location that served as an inspirations for one of the major sets in the film. Hill provides some historical context for both the novel and the film, noting that IRA activities were relatively subdued at this time. “Post-War Poetry” (16 min.) is a 2014 documentary shot for this Criterion release by White Dolphin films. It combines interviews with several people, including the great director John Boorman and the great critic Tony Rayns. This piece discusses the production in more detail with emphasis on the important role it played in Reed's career. “Home, James” (1972, 54 min.) is an eccentric inclusion, a documentary which follows a 63 year-old Mason back to his childhood home in Huddersfield, with Mason's crisp narration being a major selling point. It doesn't have anything in particular to do with “Odd Man Out” but is a treat for Mason fans. “Collaborative Composition” (21 min.) provides an interview with film music scholar Jeff Smith, author of “The Sounds of Commerce,” as he discusses the score by William Alwyn. “Suspense, Episode 460” (29 min.) is a condensed radio broadcast (aired on Feb 11, 1952) featuring Mason, his wife Pamela Kellino and actor Dan O'Herlihy. “Odd Man Out” has its share of enthusiastic boosters with a few of the filmmakers and critics interviewed on this disc calling it Carol Reed's best film. I'm not quite so keen on it (it's nowhere close to “The Third Man” for me) but it's a fine movie with a fascinating performance by Mason, a star playing an increasingly irrelevant character. Criterion has added a hefty helping of relevant extras, making this a fine companion to “The Fallen Idol” and “The Third Man,” also in the Criterion Collection.